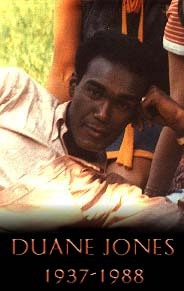 GhoulNextDoor.Com is dedicated to the memory of Duane Jones. Duane was handsome and more reserved than the other actors on the set of Night of the Living Dead and I suppose it was that reserve that contributed to the aura of mystery that still seems to surround him. He was kind to me and very gentle, even as he was throwing me across the room. I remember him voicing concern about possibly hurting me during that scene. There was just something about him that intrigued and attracted me. In retrospect, I realize that I had probably developed a small crush on him. On the day of the film's premiere, a dozen red roses arrived at my door. I was three days shy of my 11th birthday, and I'd never received roses of any color, but I knew they were a symbol of love and romance. I wanted those flowers to be from Duane, so I convinced myself (for a few years) that they were. The roses were actually sent by Image Ten, but where's the romance in that? I thought of him often through the years - not in a romantic-fantasy kind of way - but I wondered what he was doing and I always hoped I would meet him again. I never did see him again and I feel cheated. I dedicate this to him not because he played Ben, but because he was a gentle spirit who entered my small world at a strange and special time in both our lives.